The SYMBA seems to have created quite an excitement in more ways than one. One issue that I’ve seen brought up on a few occasions (not just here at TheScoop was the moral implications of a company creating a scooter so similar to immensely successful Super Cub (no not the airplane ). Well, I’m sure you’ve heard the old saying, “Imitation is the sincerest form of flattery”. That goes for scooters too. This is the Yamaha CY80, also known as the Mate (Thanks Kuroneko!). This is the SYM Wowow. See the relationship? I haven’t even dragged any of the other Chinese Cub clones into the picture, nor have we touched the similarities between brands in the “new cub” arena… the more sporty, less retro looking one. You’ll find these sorts of similarities all around Japan. As a matter of fact, if you look at the Suzuki lineup for 1991, as an example, you’ll find some uncanny similarities to the bikes of their close rivals, Honda . Does that make it right? It’s a matter of opinion, a designer might say “Heck NO!” and a businessman might say “Heck YES!”. I’m not sure about the design similarities, but the “Cub” name has definitely fought and lost the battle-to-not-become-a-generic struggle perpetually being fought by Jell-o, Kleenex, Band-Aid and i-Pod. 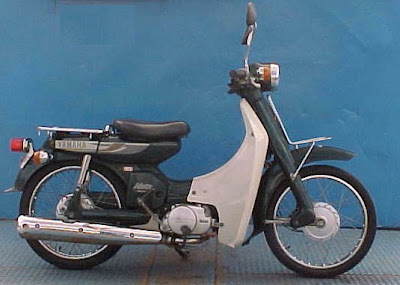 The Yamaha clones of the Cub are called Mate. 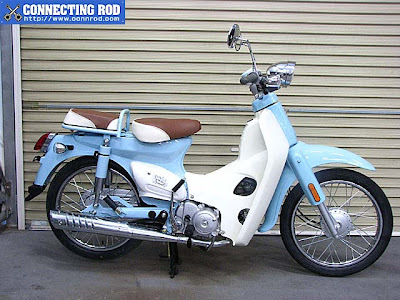 SYM also has a Cub called the Jin Wang 100cc. I wonder what it will cost. The closest in quality and displacement, 100cc I’ve seen is the Genuine Rattler ($2700), the Daelim Delfino ($2200) and the Scarabeo 100 ($2699). Daultay Dofine: This scheme of yours has failed, Lord Sidious. The cub cloning is finished. We dare not go against the Honda. Darth Sidious: Viceroy, I don’t want to see this stunted slime in my sight again. This turn of events is unfortunate. We must accelerate our plans. Begin shipping your cubs. Nute Gunray: Ah, my lord, is that… legal? Darth Sidious: I will make it legal. Nute Gunray: And the Honda? Darth Sidious: The Chancellor should never have brought them into this. Kill them immediately. Nute Gunray: Yes, my lord. As you wish. You hear that Darth Steve? SYM is THA DARK SIDE! You are in league with the Sith you dumbass! D’oh! Though, that is my favorite line from the movie. Thanks again Kuroneko. I hope things are going well in the land of the rising sun. Anon – I saw that other cub, but I couldn’t read the characters. Thanks! Orin – So true. That may be one of the reasons that Italjet went bankrupt. Many of their products were maverick… based on nothing more than the wild imagination of their creator. Tim – You cheeky monkey. Marsha – I’m not really sure what to expect, but I imagine the Symba will be in that range. I’m not sure what the MSRP was back in 1983, but I believe the dollar was a lot stronger back then. I have an ’85 Suzuki FA50 with a with an FZ50 legshield and I knida liked it from the moment I saw it. 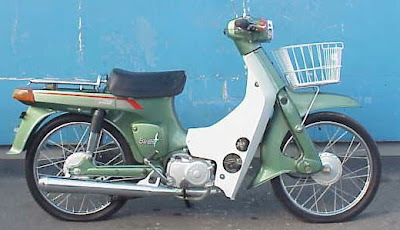 It resembles a kapchai (cub-styled underbone motorcycle) scoot. The guy with the tie needs to chill. Honda is the real Dark Side, you DuMass! I do have a name. It’s right there next to my picture of me with the tie. I love the commercial. To me that is what Honda is all about. heck, they still sell them south of the border in mexico, how hard would it be to ship a few thousand to the states?? I had even contemplated shipping them in gray-market from Mexico, but decided I would need a LOT more funding. I couldn’t just bring them in, they would need to have some sort of support set up for parts, etc… and at the end of the day, who knows if anyone could even get them registered for street use. I’m glad someone else is going to deal with all of that.